Delightful and melodic new one-act opera is fun for both young audiences and adults alike. 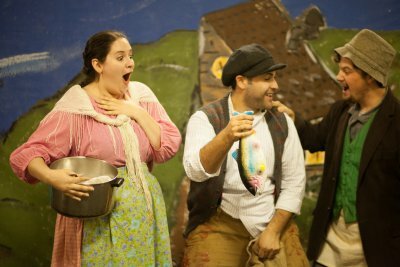 Intended for young audiences to be performed by adults, the charming new one-act opera The Magic Fish, based on The Brothers Grimm’s “The Fisherman’s Wife,” is fun for people of all ages. Reimagined by playwright Jim Knable (2008 Spain at MCC Theatre) in a witty style with lovely melodic music by composer Sunny Knable, The Magic Fish also includes clever audience participation at suitable moments. Directed by Nicolas Minas for Musica Reginae with the composer at the piano, the professional cast of singers made this Queens premiere a diverting hour of musical theater. Narrated by a new character not in the original Grimm story, the Otter who periodically asks questions of the audience, The Magic Fish is about the son of a fisherman who in trying to help out his family catches a magic fish. For throwing him back in the sea, the Magic Fish grants him a wish which the boy uses for a very large fish to take home to his parents. When his parents don’t believe his story, they send him back to ask for three new pairs of shoes. Discovering that the Magic Fish has real powers, they return to the shore to ask for first a very large boat, then a mansion, and finally to be king and queen. For each additional wish, the Magic Fish requires a bigger and bigger fee. When the items that they have been given do not slake their greed, they ask for more. But the Magic Fish asks for something they are reluctant to give. The moral of the story is to be happy with what you have rather than wanting things that may have bad consequences. The Otter turns out to be a girl who has been enchanted by the Magic Fish, all is returned to normal at the end of the opera. Sunny Knable’s music is romantic and lilting. He has called his style a cross between Stephen Sondheim and Benjamin Britten. In this he does himself an injustice as his music is much more melodic. As an American opera composer, he follows in the footsteps of Douglas Moore, Carlyle Floyd, Dominick Argento and Thomas Pasateri. Jim Knable’s libretto cleverly uses spoken dialogue for the prose passage and rhymed verse for the musical settings. The vocabulary is suitable for young children but the sentiments and plot complications are entertaining for adults. Performed by adults, the juvenile roles are deftly played. At the son of the fisherman, tenor David Burkard brought a suitable boyishness to this role of a youth who is years older than his parents. 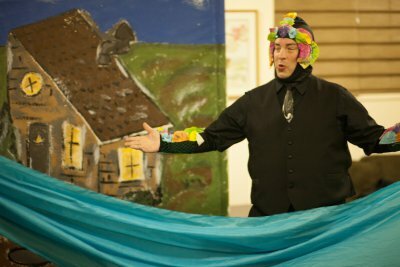 Brian Goff used his resonant baritone to bring a wry and ironic perspective to the role of the cunning Magic Fish. The lovely soprano of Danielle Good was in evidence in her roles as both the Otter and the Girl, as well as in her duets with Burkard. Soprano Laura Kay and baritone Conor McDonald gave able support as the Fisherman and his wife. Under the authoritative music direction of the composer, the cast demonstrated particularly fine top notes. The colorful and witty costumes were the work of Nicole V. Moody. The designs for the Otter and the Magic Fish were particularly memorable. Stephen Macquignon was responsible for the backdrop which served well for both the interior and exterior scenes. The uncredited props were delightfully in keeping with the ironic tone of the production. There are few new American operas and even fewer written with young audiences in mind. The Brothers Knable have a hit in their collaboration The Magic Fish which has been given an excellent production by Musica Reginae. The odyssey of a young NYC schlemiel whose luck changes is told in this pleasant well-performed musical absent a gripping plot that’s a mild diversion.